Recently, I was watching Food Network show called “Diners, Drive-Ins and Dives” hosted by Guy Fieri. In one episode, he went to one restaurant that specialize in BBQ and he got to learn some of their popular dishes and dessert. 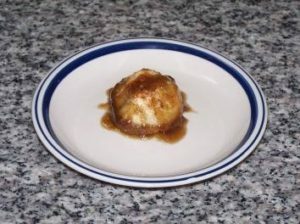 One dessert in particular called “Apple dumpling” was intriguing to me and I thought it could somehow make it into healthier, toddler friendly recipe for our son “Liam”. Then, next time I wanted to make snack of the day for Liam, I decided to do toddler friendly version of Apple dumpling and started building a recipe and experimented to make one for him. Result was good. He loved the tender touch sweet Apple inside the flaky pie crust and,he enjoyed the snack very much. Apple dumpling known for the public is made from tart Grainy smith;cored peeled and butter usually about 4 tsp and brown sugar 2 tsp to 4 tsp inside the hole.Then the whole apple is wrapped by pie crust and being baked in some kind of syrup like.. the one made from 1.5 C brown sugar,1 C water,1/2C butter . Usually kcal for one Apple dumpling runs around 700kcal to 800kcal. Obviously, 1 whole apple is too much for Liam, and sauce seems a bit too rich and too sweet for him. And it is high fat high sugar content and I did not want to give him such a high kcal snack either even if I make the way it should be down and give him some section for.It still is high fat,high sugar content.. This is my version of toddler friendly Apple dumpling; low calorie, low sugar, low fat. My husband enjoyed the Apple dumpling that I made and I loved it too so, I am sure you would be able to enjoy these too. In this entry, I would like to share the recipe for Apple dumpling toddler friendly version with you. I do not bake with volume (using measuring cup) anymore.I do bake with weight (grams). However, pie crust recipe is from the time I was still baking with volume and I forgot to write down the weight measurement so I am giving you the volume measurement with this one. Please note that when you bake with volume measurement, 1 C of flour can vary from one person to the other, and baked goods result can be somewhat different. 7. Add in sauce mixture in the pan to the 1/4 – 1/3 depth of each dumplings. you can save the rest of the sauce to use for your oatmeal or pancakes or for drunken apple in the skillet etc. In Japan, mothers usually start feeding solid food to babies around 5 months old or 6 months old. Then, right around 7th or 8th month where babies turn 1 year old or so, 75%-90% of nutrition they need throughout the day would come from solid food itself. Then, nutritionally, they do not need breast milk anymore to supplement the solid food nutrition. When graduated from breast milk, 100% nutrition would come from solid food itself. Around this time, babies would have more will to eat and get better at eating with fingers. At the same time, right around this time, babies gets more active throughout the day and they need more nutrition from supplemental solid food,a.k.a. snack. Mothers in Japan usually feed babies these supplemental meal once or twice a day often times 10am and/or 3pm. Since having routine is a good thing for biological clock for babies, we feed snack at about the same time everyday. When you hear “snack”, you would imagine sweet desserty stuff but really, for the babies around this time, snack in Japan means 4th meal to supplement nutrition from other 3 meals. Babies have small stomach and with just 3 meals a day, they cannot get enough energy from the 3 meals. Therefore, we give them 4th meal so they can supplement the deficient / not enough nutrition/energy. Mini rice balls, mini sandwich, steamed sweet potato, fruits, steamed bread with vegetable mash or puree etc.. are popular snack for Japanese babies. Our son eats pretty good and, he gives me clean plate so, I do not have much stuff I must add in snack time stuff to compensate the lack of nutrition from other 3 meals. Therefore, I am a little loose on what I use in his snack. However, I make things with much less sugar, and I try to make something good for him using vegetables or fruits from the fridge or other stuff that are good for him like kinako, which is roasted soy bean flour we Japanese often use just like cinnamon in USA in a sense. Kinako is good protein source and very nutritious for us. If you are interested, you can get kinako at Asian store like HMart or at Amazon. In this “Snack of the day” series, I would like to introduce baby friendly snack recipes you can make at home. All of the recipes that I would share would be low in sugar but, adults can enjoy them too. I prefer making snack for our little son than buying snack sold for adults for him. It would be better for his taste buds development, and not getting to be able to taste the strong taste would be good for him in the long run. Very first recipe that I share with you is very very easy snack you can whip up on 15-20 minutes plus chilling time in the fridge for a couple of hours. Liam loves these. I hope your little one enjoy them too! However,please make sure that all of the ingredients for the recipe is tried with your little ones and no issue with allergy. 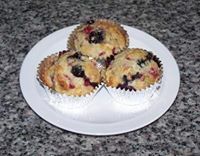 ** Try microwave 10 seconds,5 seconds or so each time and mix with spoon and microwave more if needed. Please be careful container may be very hot. 4. Add gelatin water mix into the blender and mix very well about 20-30 seconds . 5. 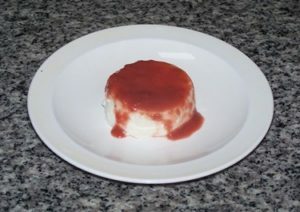 Pour the mixture into ramekin and cover the top with plastic wrap and chill until set;about a couple of hours. 2. Pour them into small 1 quart sauce pan and add sugar and water and cook until thicken. 1. Run the butter knife around the ramekin cup, put the ramekin cup upside down onto a serving plate and hold the ramekin cup with plate securely and shake top and down to make the mousse pop down onto the plate. 2. Pour some strawberry sauce and serve.